We have a vision zero. We know that we still have a long way to go. And that we’re unlikely to achieve this goal in the next few years. But we’re starting the journey today. Working with our partners, organiser associations and spectators, our goal is to reduce our negative environmental footprint, and in the long term to create a climate-neutral Rally Sweden. it’s a growing sport that many people love. This is why we take environmental work very seriously. We are aware that it’s difficult, perhaps even impossible, since certain de- cisions are beyond our control — such as the teams’ choice of cars and how our spectators choose to get here. And of course, much of the work is done by volunteers and in private vehicles through collaboration with the organizing clubs of Rally Sweden. But we will do our best, working with our partners, to improve our performance and be a driving force in creating a vision of the sustainable rally event of the future. We’re not starting from scratch — we’ve been working with environmental issues for several years. What we’re doing now is setting some ambitious goals which we know will be hard to achieve. Because we’re dead serious — we really do want to create a climate-neutral Rally Sweden. You can now take on the FIA Smart Driving Challenge and compete in teams led by stars from the whole wide world of motor racing: WRC, F1, WRX and so on. This is a global competition for everyday motorists. Using your own car, a smartphone, the FIA SMART app and a plug-in (an OBD reader), you can compete against motorists from around the world in your day-to-day driving. The best teams and drivers come face to face in a final, and prizes are awarded along- side the FIA’s annual prize-giving ceremony for all racing series in Paris in December 2019. We’re all here to experience the rally, the action and the party up close. But rally is a sport with small margins, and there’s no room for mistakes. Read the safety information. Follow the safety marshal’s instructions. Take care of each other, and keep the party going. And equally important: don’t forget to respect the environ- ment as well as the safety instructions. — leave no one and nothing behind! We want to create as little waste as possible. That’s why we use real cutlery and crockery in our VIP tents, and the food sold out in the forest is mainly eaten without cutlery. We are phasing out all disposable plastic items and are working hard to prevent food waste. This is also about leaving the forest in the same condition as when we arrived — without leaving any rubbish behind. Throwing all your litter in the designated sacks and bins. This also applies to disposable barbecues, cans and bottles. available close to all our entrances, to use for your rubbish, and discard them in our waste containers. You can also leave your bag clearly visible by the safety tape along the side of the track. If you go into the forest—always bring all your waste back with you. 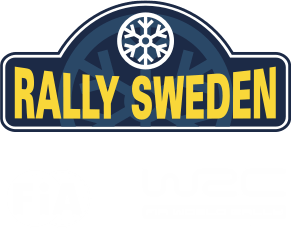 — so you can enjoy Rally Sweden from virtually anywhere along the various stage routes. But this right comes with responsibilities, the main one being that you should always leave the forest exactly as it was when you arrived. It is permitted to make fires in the forest — but you must NOT cut down trees or bushes, for firewood or any other purpose. This is a crime under Swedish law. You are also responsible for ensuring that no fire or glowing embers remain when you leave the site. We’ll do our best to limit the environmental impact of our transports by streamlining transportation and using vehi- cles with the best environmental performance possible. We’ll also use renewable energy sources wherever we can, and minimise our consumption of other fuels. If possible,take the train to Karlstad and the Rallybus out to the races. These are comfortable, convenient ways to travel and you avoid problems with parking. Use an electric or hybrid vehicle. Charging points are shown on the rally map. Or drive safe and eco-friendly with your fossile fueled vehicle. Carpool!Ideally several people can share a minibus.